While most New Yorkers have a hate-hate relationship with the ubiquitous street rodents, a surprising number say the domestic creatures make perfect companions. After all, rats are very intelligent, can be trained like dogs and are clean like cats. The social creatures are also expressive, able to bond and very playful. So says Raquel Citron, longtime rat enthusiast and organizer of the N.Y.C. Rat Meetup Group, which boasts a robust membership of 425 local rat fanciers. In fact, whenever Citron walks into her Manhattan apartment, her pink-eyed white rats, Gina and Becky, jump up and down and run to greet her. Citron rescued her first rat 18 years ago from a university laboratory, where she grew cells for human cancer research. She has since had dozens of rat companions, and works to educate the public and facilitate rat rescues around the country. The average pet rat is 6 inches long, has a 6-inch tail and weighs less than a pound. Females breed year-round and can have 20 or more babies at a time. In the wild, rats naturally become aggressive and learn to bite as they compete with other rats for food. Rats only live an average of two to three years, with death often brought on by respiratory infections or tumors. But Manhattan artist Dani Wilbert believes that rats can live longer with proper nutrition. “I had a rat that lived six years,” said Wilbert, whose paintings and sculptures are inspired by her love for the species. Her four pet rats – and newborn litter of six – eat a diet of veggies and “superfoods” that she believes reduce the risk of disease. She is also a big proponent of rescuing rats from pet stores, breeders and shelters. Last year, 16 pet rats landed at NYC Animal Care & Control Shelters. Rescue groups take most of them out of the shelters and find them homes. Writer Mil Scott and her husband rescued their first rat, Molly, in 2005, when they stopped at a mailbox after a snowstorm and saw a shivering white creature gently digging in the dirt. Today, the couple share their Washington, N.J., home with 11 rats, including Dumbo-eared, pink-eyed whites and straight-eared Berkshires. Molly has since passed on, but her loveliness inspired Scott to create The Rodent Reader Quarterly (rodentreader.com), a magazine that aims to communicate the positive nature of rats through literature and art. The magazine’s Facebook page boasts 2,500 fans. 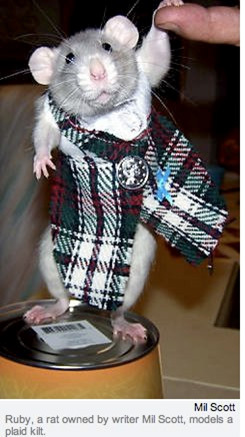 Tomorrow, the rat-curious can head to the NYC Fancy Rat Convention for a rat fashion show, a rat showcase, education and a screening of Disney’s “Ratatouille.” The show is from 11 a.m. to 4 p.m. at 320 Studios, 320 W. 37th St., 14th floor, in Manhattan. Admission is $2 and free for kids under3.